Remains of majestic monument of Lithuanian Jewry destroyed by the Nazis has been found underground, excavation is next. 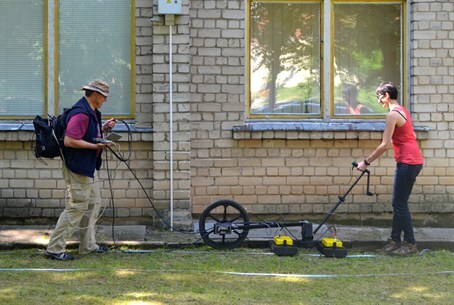 The underground remains of the Great Synagogue of Vilna, which was destroyed by the Nazis during the Holocaust, have been uncovered in a Ground Penetrating Radar survey. The survey, conducted in June 2015, leads the way to an excavation next year to dig up what remains of what was Lithuania's greatest synagogue before the war, which is now partially covered by a school. Vilna's Great Synagogue was the oldest monument of Lithuanian Jewry, and now a joint team led by Dr. Jon Seligman of the Israel Antiquities Authority (IAA), Zenonas Baubonis of the the Culture Heritage Conservation Authority of Lithuania, and Prof. Richard Freund of the University of Hartford, have found its underground location. The synagogue was built in the 17th century CE in Renaissance-Baroque style, and was surrounded by other Jewish community buildings including 12 synagogues, the community council, kosher meat stalls, the famous Strashun library, a complex of mikvaot (ritual baths), and more institutions. After the Nazis burned down the synagogue and destroyed the entire Jewish community of Vilna, the Soviet authorities demolished the remains and built a school in its place. But the survey shows significant remains of the important building still exist underground, including sections of the synagogue and possible mikvaot remains. In the excavation planned for next year, a joint team of archaeologists and student volunteers from Lithuania, Israel, and Jewish communities around the world plan to take part in renewing the synagogue's presence.